"Mr. Speth has obviously done a LOT of research before writing this book! The story of how he got started collecting the images is fascinating in itself, as well as detailed information about the Centennial Photographic Company and their involvement in the New Orleans exposition. However, the images are the highlight of this book. I can only surmise at how much time and capital Mr. Speth has invested in his 30-year collection of images! The book is well worth the price of $34.95, as acquiring the actual images included would cost hundreds of dollars more! The fact that only half of Mr. Speth's entire New Orleans photographic images collection is included in the book makes you wonder if he should do a "sequel" featuring the additional images! 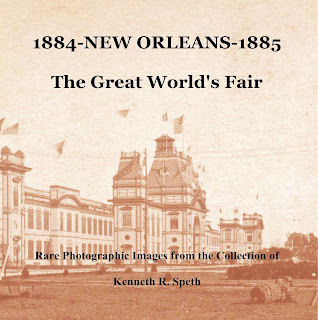 I was truly intrigued by reading "1884-New Orleans-1885 The Great World's Fair", especially since this event has been nearly forgotten by historians. Granted, the New Orleans expo did not have the "pizzazz" of the 1876 Centennial in Philadelphia, but despite its shortcomings was a World's Fair well worth visiting at the time. 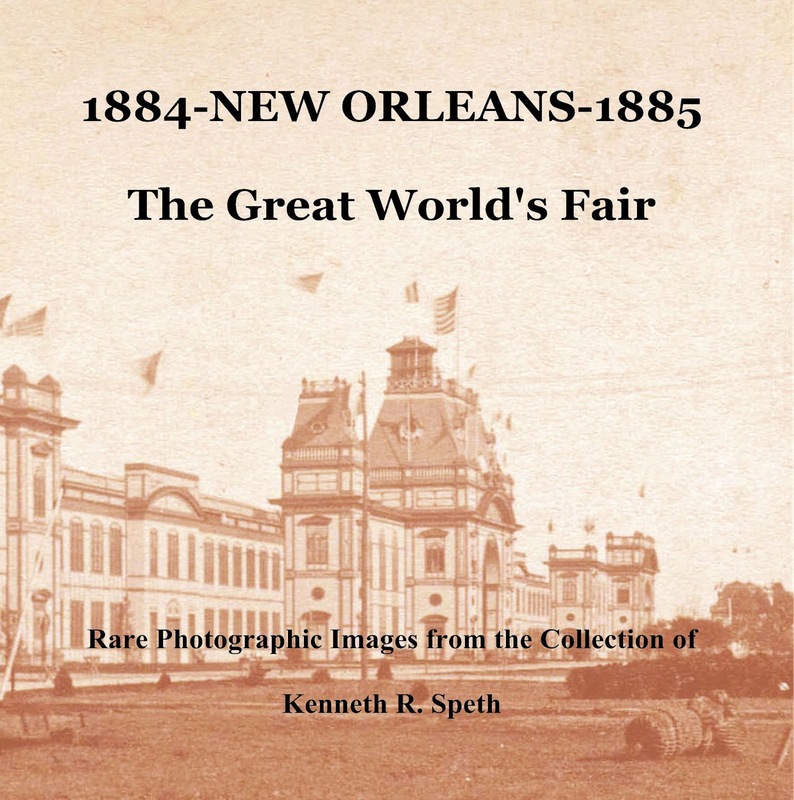 Kudos to Kenneth Speth for putting together such a comprehensive book (the only one I am aware of) featuring rare period photos of New Orleans and the World's Exposition!" 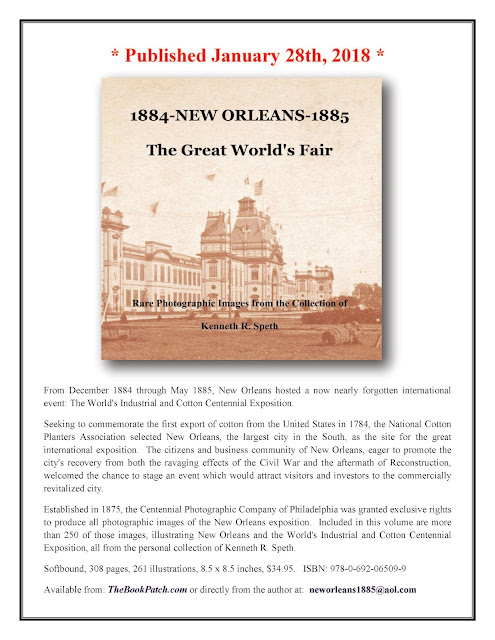 My new book "1884-NEW ORLEANS-1885 - The Great World's Fair" - ISBN 978-0-692-06509-9 - is now available! 308 pages, with over 250 rare photos of the event from my personal collection. After the close of a successful 5-1/2 month long 1935 season, it was decided to re-open the California-Pacific International Exposition for a second season. Numerous changes were made to the grounds, buildings, attractions, and night illumination to create a totally new experience for 1936. Along the Avenida de Palacios a majority of the Blackwood acacia trees were removed to provide better views of the buildings, and additional landscaping was added. 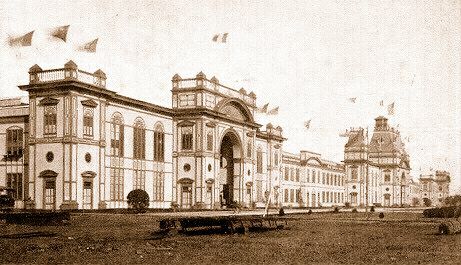 Many new exhibits were also introduced, and the House of Charm was re-named the Palace of International Art, and the Palace of Photography became the Palace of Medical Science. Within the House of Hospitality, the second floor loggia, located at the west side of the central patio, was enclosed with large glass doors; and the rear portion of the Casa del Rey Moro Café was enlarged to provide more indoor dining space. The most noticeable changes were made to the Palisades section, located south-west of the Avenida de Palacios. The Plaza de America was completely re-designed with a double-row of Queen Palms planted at either side, bordering a vast garden of multi-colored flowers; and the Firestone Fountains were replaced with the new Rainbow Fountains. Several buildings were also re-named and a majority of new exhibits added. 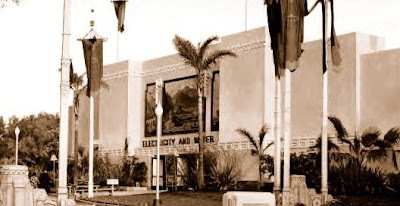 The Palace of Travel, Transportation and Water became the Palace of Electricity and Water; the Standard Oil Tower to the Sun was re-named the Standard Oil Natural Parks Tower; the Hollywood Motion Picture Hall of Fame became the Palace of Entertainment; and the Palace of Electricity and Varied Industries was changed to the General Exhibits Building. At the south end of the Plaza de America, the large Ford Motor Company Building was transformed into the Palace of Transportation. Ford had relocated their extensive exhibits to the Texas Centennial Exposition in Dallas, so the building's interior was re-designed to house an exhibit showing the history of transportation, from primitive times to the present. At the north-east portion of the grounds, the former site of the Casa de Tempo became a children's amusement area known as Enchanted Land; and the center section of Spanish Village was transformed into a large open patio. The Zocalo was re-designed in a moderne-style, surrounding a large landscaped plaza; and included completely new attractions such as "Hollywood Secrets" (showing modern technology used in making movies), the Danse Follies (a musical extravaganza), Big Top Circus (a revised midget show), Strange as it Seems (replacing Ripley's Believe it or Not), and the "Days of '49 Stockade" (replacing the ribald Gold Gulch). Despite much controversy, the Zoro Gardens nudist colony was retained due to its generation of revenue for the exposition. Dramatic new night lighting was introduced for the 1936 season, which used mobile-lighting to paint the buildings and trees in a vast spectrum of changing colors. 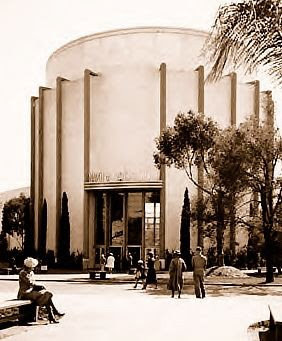 Unique lighting was also added to Palm Canyon and the Alcazar Gardens which created a "firefly effect" surrounding the landscaping; and a revolving beacon, located atop the tower of the Palace of Science, flashed beams of white light visible for sixty-miles. Facing the Plaza de America, the Palace of Transportation was illuminated in translucent-blue, topped by a glowing gold rim; and further enhanced by the Rainbow Fountains, which displayed ever-changing patterns of water in misty multi-colored sprays.